December 2015 was the warmest December on record with a combined average global land and ocean temperature of 2.00°F, or 1.11°C, above the 20th century average. This is the highest departure among all months in the 136-year historical record. December’s record warmth contributed to 2015 being Earth’s warmest year on record with 10 out of 12 months breaking previous temperature records. This dataset shows some of the major December weather and climate highlights from the National Climatic Data Center’s (NCDC) monthly global climate analysis, and serves as an overview of what can be discussed in the datasets that follow. Highlights are noted below. 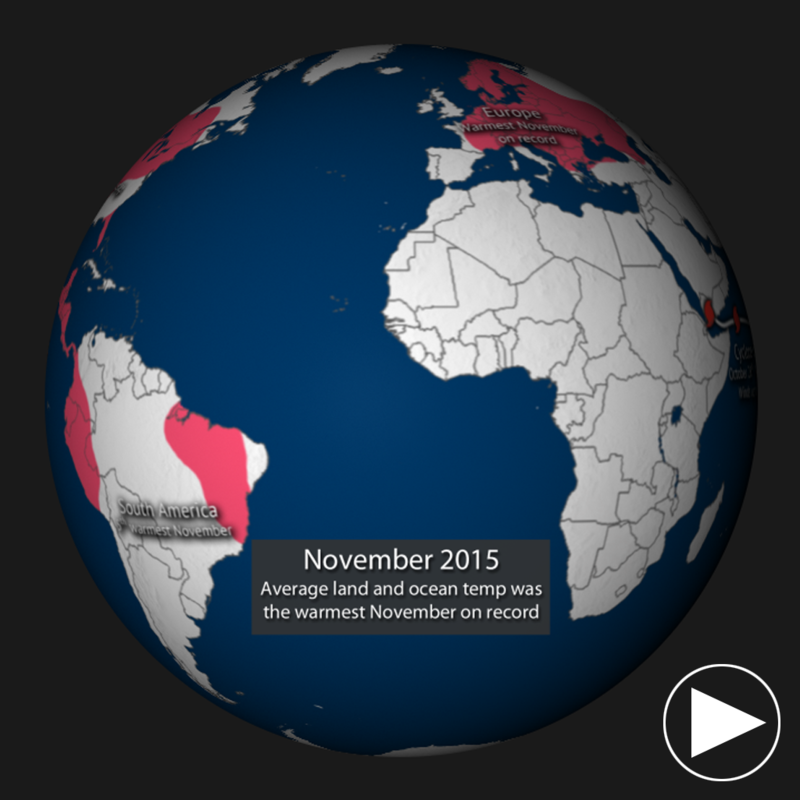 South America was record warm. The United Kingdom, France and Germany experienced their warmest December ever. As a whole, Europe experienced its warmest December since 1910. 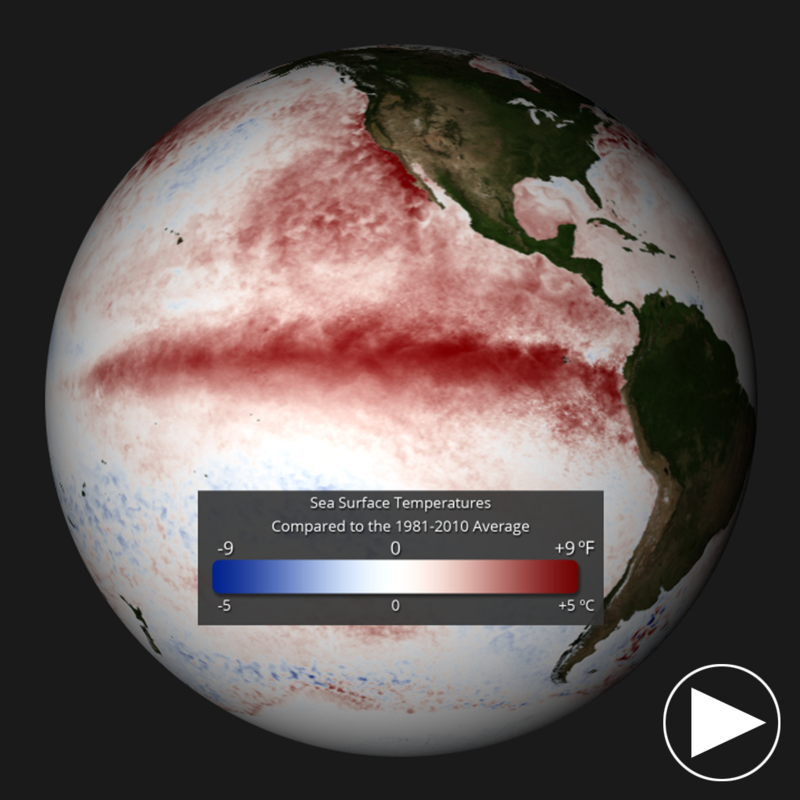 The real-time sea surface temperature anomaly dataset is a great way to visualize the El Niño – Southern Oscillation (ENSO) in the eastern Pacific Ocean. According to NOAA’s Climate Prediction Center, strong El Niño conditions have peaked and are expected to to weaken during spring 2016. Remember blues indicate cooler than average temperatures and reds indicate warmer than average temperatures (white: average). 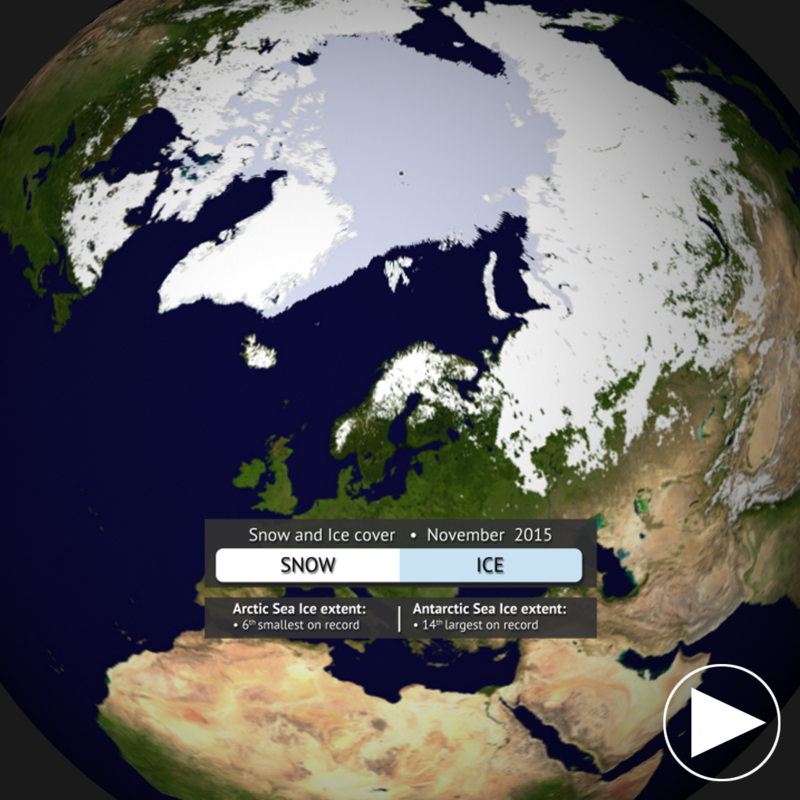 Aside from helping to illustrate seasonal changes, the real-time Snow and Ice Cover dataset is a great way to convey sea ice change through time, including discussing how the current sea ice extent compares to other noteworthy years. The December 2015 sea ice extent for the Arctic was 6.0 percent below the 1981-2010 average. This was the fourth smallest December sea ice extent since satellite records began in 1979. In Antarctica, the sea ice extent was near normal. Be sure to check out the 3-month seasonal outlooks for February-April. Where do I find the datasets? In addition to the normal files, there is now a “digest” section. This section in the file structure has all of the normal files compiled into one video. If not, you can download the datasets and playlist files from this FTP Site. Then download and use playlist files at the top of the page (or create your own) and make sure they are in /home/sos/sosrc or /home/sosdemo/sosrc. NOAA National Climatic Data Center, State of the Climate: Global Analysis for October 2015, published online November 2015, retrieved on November 21, 2015 from http://www.ncdc.noaa.gov/sotc/global/.